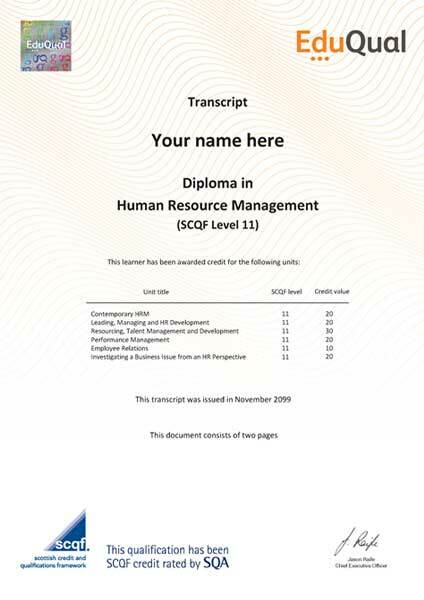 The Diploma in Human Resource Management (SCQF Level 11) is a 120 credit size qualification, consisting of 6 compulsory units and is a Regulated Qualifications Framework (RQF) equivalent Level 7 qualification. The Diploma in Human Resource Management offers learners without prior experience the knowledge and skills they need to be operationally effective in a career in the Human Resource Management field. For those learners that have prior experience in Human Resource Management and who also possess a professional qualification, the pathway through this programme will develop their professional competence. This qualifications at Level 7 represent practical knowledge, skills, capabilities and competences that are assessed in academic terms as being equivalent to Masters degree level. This Diploma in Human Resource Management consists of 6 mandatory units for a combined total of 120 credits.